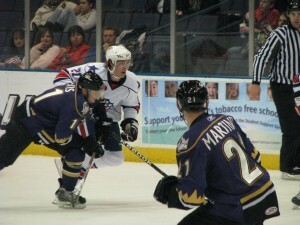 Amerks Continue Their Losing Streak...Lose To Manchester · Let's Go Amerks! 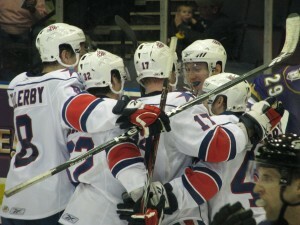 The Amerks put up a good fight, but couldn’t get past the Manchester Monarchs tonight. They lost 4-2 to the Manchester Monarchs in a hard fought game. Chris Beckford-Tseu started the night in goal even though I would have liked to see Shantz in from the beginning. Chris was pulled in the first period after allowing two goals. Once Shantz was in net, it was a whole different game. I am not going to say the first two goals were completely Chris’s fault. The first goal was scored when Jordan Henry took his 56,723rd hooking penalty of the season. He was shortly joined in the box by Rory Fitzpatrick when he shot the puck out of the park while in the defensive zone for a delay of game penalty. I don’t understand why Jordan Henry isn’t being penalized by the team for what he is doing. He has played in only 8 games and has already gotten 18 penalty minutes. If these penalties weren’t so stupid, I wouldn’t be so angry about it. But, they are always hooking penalties (aside from the wonderful cross-checking penalty he took during Wednesday’s game…also brilliant). Peter Aston could be playing in his spot. I know some of you don’t think Peter would be a good addition to the roster right now…but, let’s get serious here, Jordan is putting us shorthanded at least twice a game. 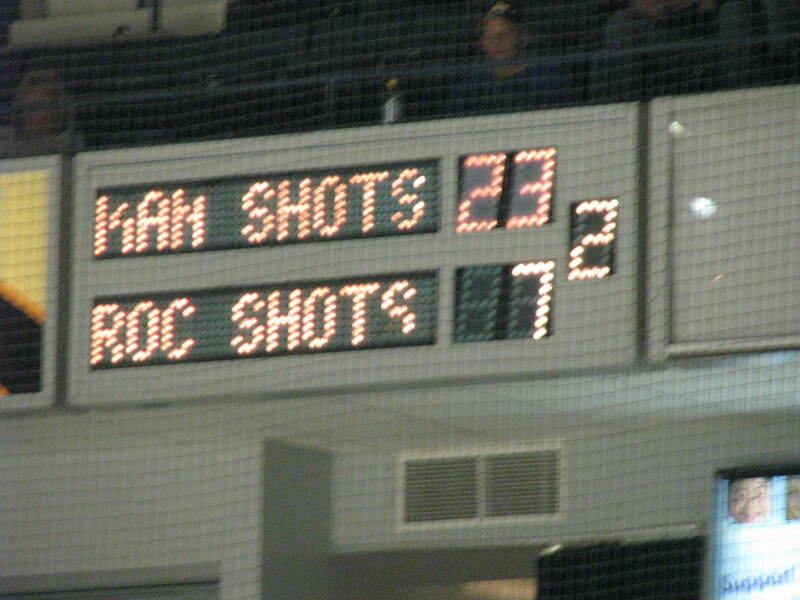 The Amerks were outshot 20 to 5 in the first period. What a wreck. We were shorthanded for just about half of the first period. So, that certainly wasn’t helpful to anyone. The penalty kill can only do so much before they are so tired they can’t move anymore. In the second period, things really picked up. Dan Collins showed he really doesn’t want to be moved to the ECHL just yet by scoring back-to-back goals for the Amerks. He was named the 2nd star of the game for the night. In the 3rd period, the Monarchs took the lead once again when Shantz let in the his only goal of the night. It was once again scored when the Monarchs were on a 5-on-3 powerplay again. Franklin MacDonald took a pretty bad hooking call, followed once again by a delay of game penalty for shooting the puck out of the defensive zone. This time it was Keaton Ellerby who got the 2nd penalty. 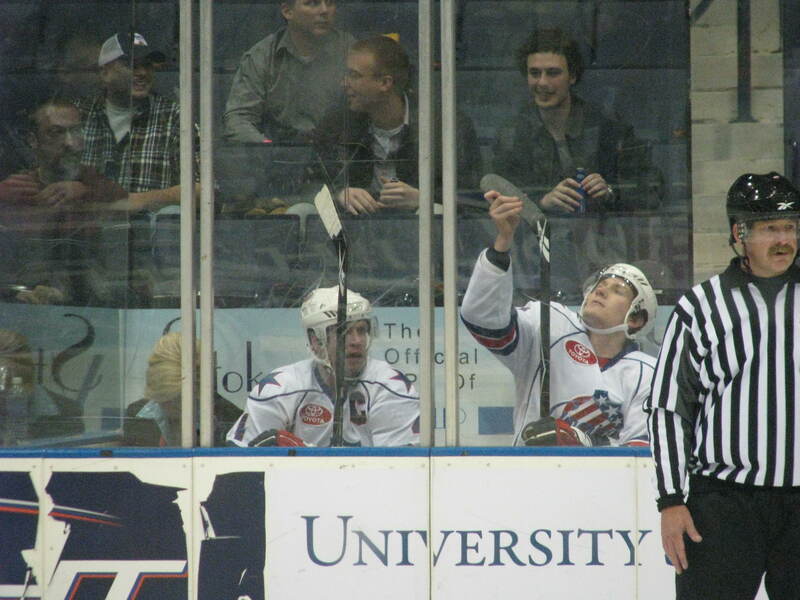 He was close to hitting the glass at least. The Monarchs were once again on the powerplay later in the period when Mike Duco caught a breakaway. He absolutely had the goalie eating out of his hands but dinged it off the post. An inch to the left and it would have been tied. I’m sure he is hating himself about that one now. The last goal was a crazy empty net goal scored while the Monarchs were shorthanded. Garrison was covering the whole blue line by himself while Rory pinched up to the net. Monarchs’ goaltender Jonathan Quick made a save and Andrew Campbell flung it up the ice where he got lucky and it landed just inside the right post. The Amerks have a few days off now to get themselves into shape for the Toronto Marlies on Wednesday morning at the Riccoh Centre. Our family will be going up for the game, so expect a good report. I say good because I plan to see the Amerks win with the return of Karl Stewart. Never in my life did I think I would want a Stewart to return…but, Karl is no lazy Anthony.